Dividing Iris is easy and is a great way to get more to share. It also keeps your Iris healthy for great blooms! 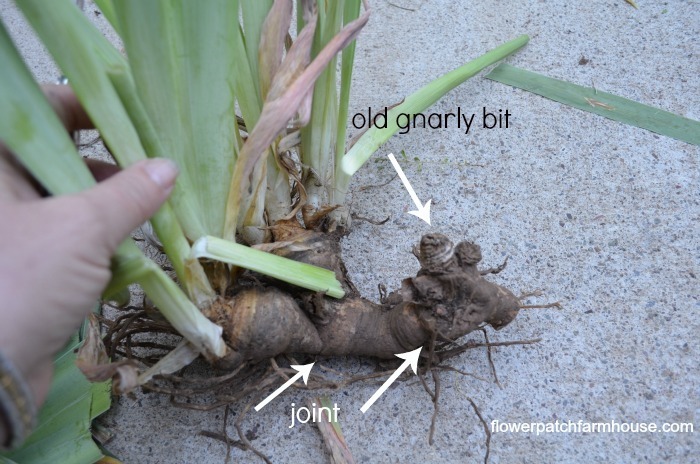 Here is an easy how to divide Iris Rhizomes step by step with video. 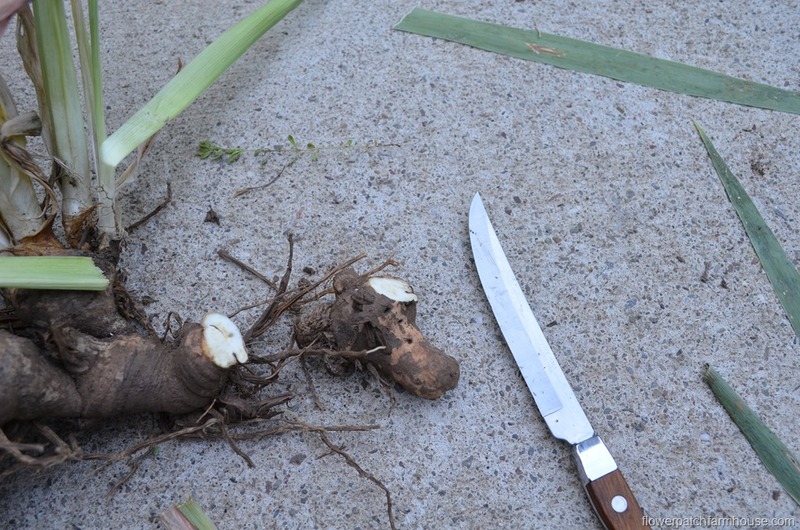 In this post I share how to divide Iris rhizomes, an easy step by step photo demonstration. Iris are such a fun plant and so rewarding. Have you planted some and now they have started to not produce as many blooms as in past years? Iris usually need to be divided once every 3 years or so. That is not a hard and fast rule but a generalized observation for most. I live in the Sierra Nevada mountains of N. California at the 4500 foot level. We get plenty of winter snow and cold, then some mighty fine summer weather averaging in the 80’s to low 90’s. We are considered a Zone 7 (we have now been upgraded to Zone 8). I have gardened with Iris for 35 years now. Here and in the San Joaquin valley. It is best to wait 6 to 8 weeks after bloom to divide, it gives them time to store up some energy, but I also have had success digging up and replanting right as they are done blooming. I do better in remembering what color is where, I always say I am going to mark them while blooming and somehow never get around to it. This clump of Iris is done for the season. 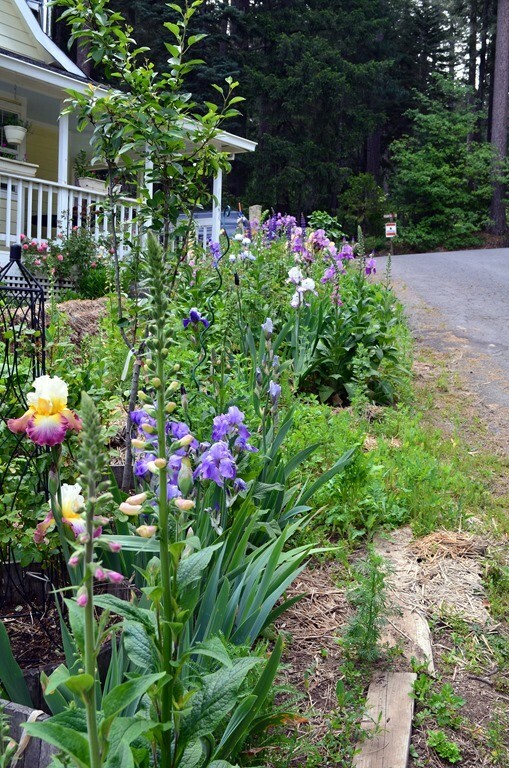 Some varieties will bloom again if you dead head, they are called reblooming Iris and it will be noted with the rhizome when you order or buy them. Some people tidy the plant after blooming by shearing off the leaves, but I don’t. The rhizomes are fed by the leaves and it is better to let them remain to soak up the summer sunshine and build but a food store for next years blooms. 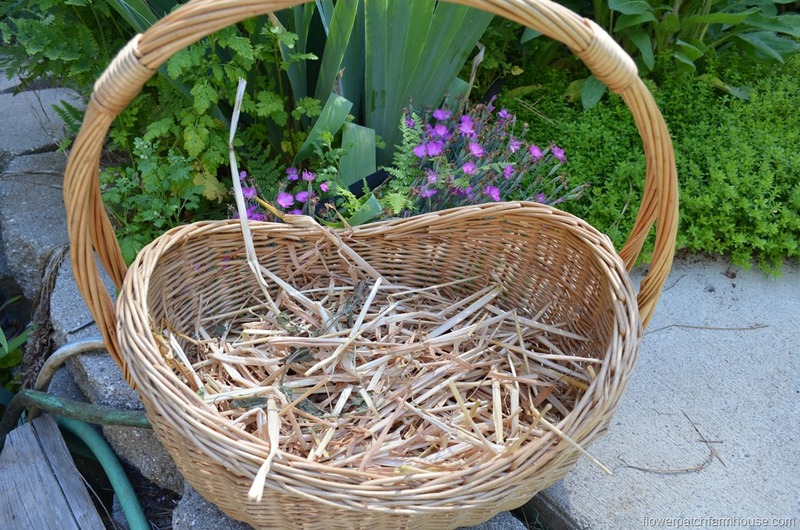 If I am going to store or cure the rhizomes to give away I prepare a container with a bit of straw to lay them in. The straw allows air to circulate around the rhizomes which discourages rot. I also just lay them out on the ground or on our deck to dry. We live in a low humidity area so this is sufficient. Some dust the rhizomes with sulfur or a powdered anti-fungal. 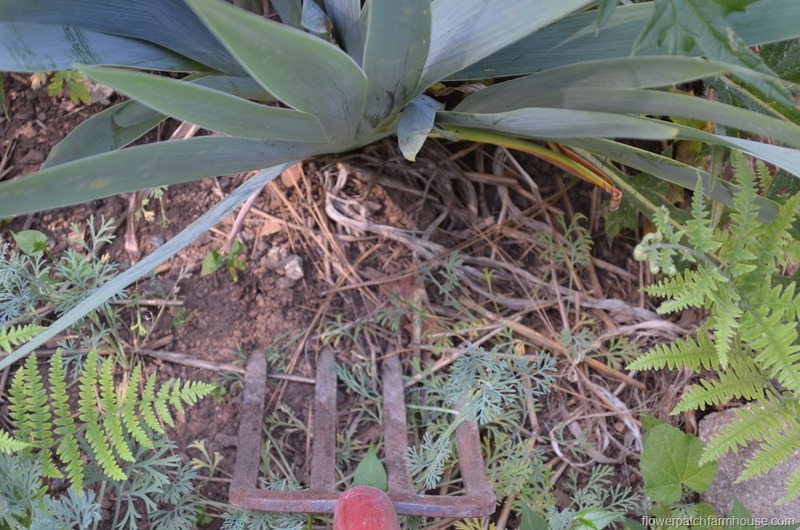 Start a good 5 to 6 inches back from the base of the Iris clump and dig in your shovel or garden fork. 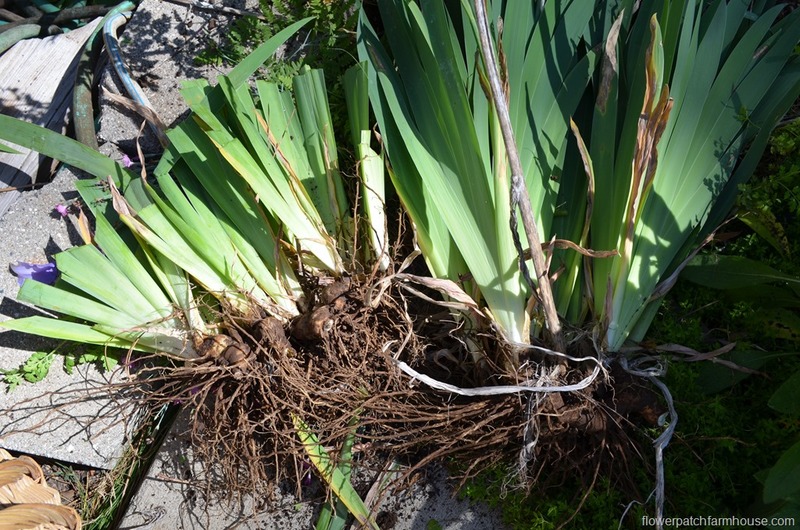 Iris are not planted deep, they should be very near the surface but their roots can long. 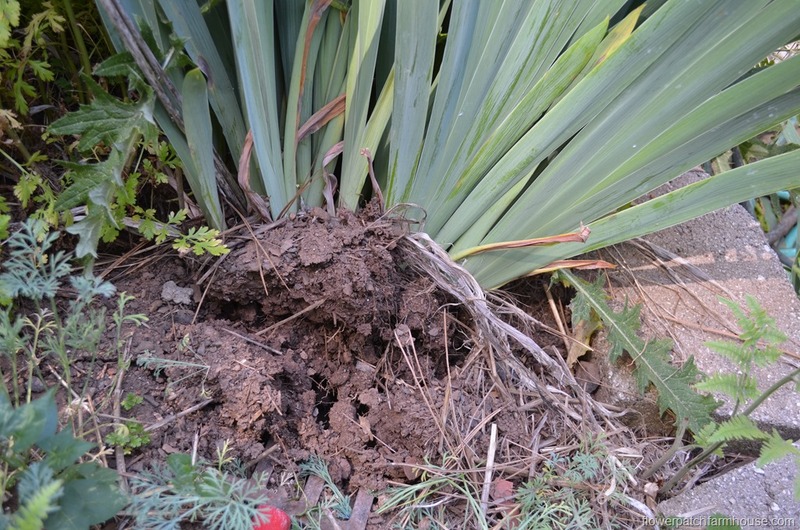 In the video attached you will see I really have to put some muscle into digging around the clump I am dividing. Work around the entire clump to loosen it from the dirt. Once you have it well loosened it should pull up very easily. 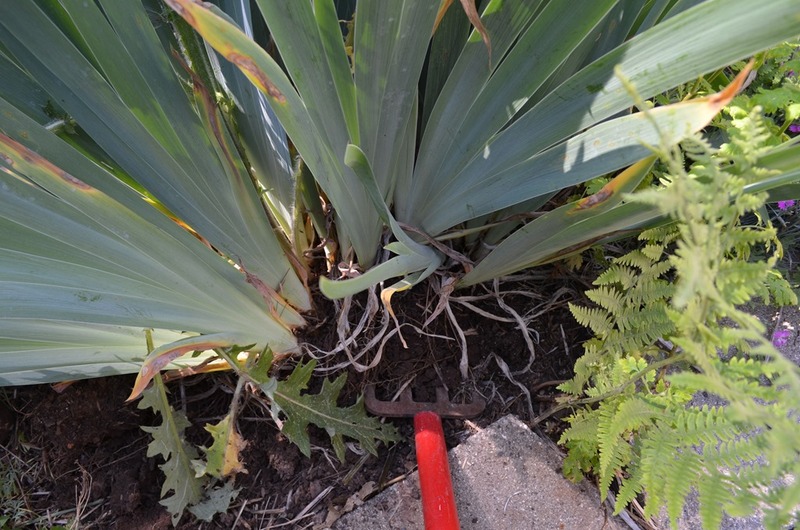 You can merely shake off the dirt or hose off the excess dirt to inspect the rhizomes for rot or insect damage. The roots can by quite long and I trim them back for easier replanting. I grab the roots at the base of the rhizome and cut what hangs below my fist. Then I trim back the leaves to about 6 inches long. Sometimes rhizomes will separate themselves from the clumps voluntarily but usually I need to cut them apart. To separate and/or cut out diseased and old gnarly bits, use a clean sharp garden knife and cut it off at the joint. It is highly recommended to thoroughly sanitize your cutting tools between cuts so you do not spread disease. Denatured alcohol or bleach water works best. I have never had an issue with disease so you don’t see me cleaning between cuts. I started to use the basket with straw but had way too many rhizomes so I laid most of the out on the shady porch to dry. 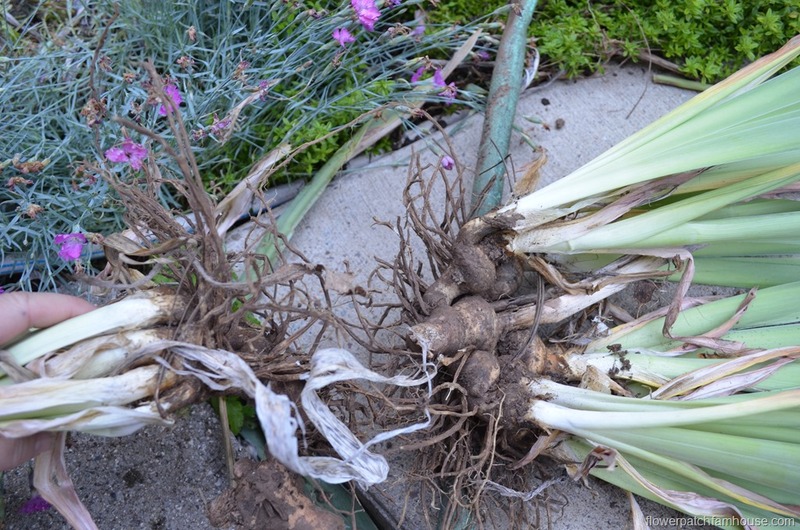 If you are not giving the extra Iris rhizomes away you can replant immediately, click here to see how I replant. I will print a photo of the Iris in bloom and place it with the rhizomes I am giving away so whomever I gift it too will know what color it is. If I am replanting in my garden I keep a hand drawn garden map of where I have put things. This past summer I kept a video garden journal and that has been excellent and helping me see what is where at any particular time of the growing season. I wish you great success with your Iris, they are one of my favorites and they are so easy. You have a lovely garden. Irises are on my future list. My Mother has a couple of Irises that were passed along to her from my aunt . Mom has not divided hers yet and I’m happy to have come across your post so that I can pass on how she can do this and perhaps pass me along some of hers in the future…. Thanks for sharing. P.S… Her irises bloom once in the spring, are there re-blooming irises? There are some that re-bloom in late Summer or Fall but it depends on many factors in your garden so they are not guaranteed to re-bloom. Schreiner’s Gardens has a collection of 9 re-bloomers in their online catalog right now. I am going to post how I replant my iris’ so stayed tuned. Thank you so much for this, my mother has a bed full and always shared. She now has dementia so can not do this now . I want continue sharing her Iris’ with others but wasn’t sure how until now. Looking forward to “how to plant”. That ‘how to plant’ post is coming up shortly. I promise. The Iris is probably my favorite flower. I am not a “gardener”, except of the few things I like. Unable to do much due to health issues, but so happy to find this information regarding the Iris. I have few kinds but would like to enlarge my collection and have begun to make arrangements with some friends to exchange with each other. This information you provided will prove priceless to us since we are not experienced. Thank you. I will be following you and your instructions hereafter. Welcome and check back in, I am going to show how I plant them too. Not that it is hard but sometimes pictures along with the words help. Thanks for the tip. Will be heading out to the garden to work on my iris! I am glad you found this helpful. Many have pointed out to me that the ideal time to transplant iris is late Aug. early Sept, but I have found doing it now works just fine. I just wanted to let you know that in case you wished to wait. I prefer this time of year for various reasons and have asked other master gardeners and they concur that is it just fine to do it soon after the blooms have faded. Your post helped me so much! I have Iris and Lily over-load! I have been told that I can dig them up any time, but I was not certain. I would love to replant some by my yardbarn, but I was always afraid to hurt them. Do I have to use a fork-like tool? Hi Pamela – thank you for your nice, clear instructions. Gardening is something I’ve longed to do for many years, and now I finally have some time to get out there. We got some irises about 18 years ago(!) from Dominion Seed House as it was closing its nursery operation here in Georgetown, Ontario. Those irises are still blooming! No thanks to me. I finally divided some last year, and a few are still blooming just now. But this year, thanks to your instructions, I will divide them properly. Until I saw your pictures, I never knew their were so many kinds of irises. Thanks again! The traditional best time to separate is in late Aug and Sept and that is the hottest time and the reason is the leaves (if left whole, not trimmed) produce nutrients in the rhizome for the following bloom season. Here we can get snow in early Oct so if I wait till then they don’t get established well before the cold sets in. I am planning another post as we speak on planting, so check back in if you wish but the answer is yes you can plant them right away in another part of your yard, I only cure them a bit to discourage fungus or if I am giving them away. (or if I am lazy and don’t have time that day to replant) 🙂 I confess to being the laziest gardener! Pamela, I have a large patch of Iris’s that were here already when we bought this 100 year old farmhouse 15 years ago. They are not producing many flowers anymore and I know they need to be divided. My question is, now much “thinning” should I do to the patch to get them back to producing more blooms? I also didn’t know about the dead heading and letting the stems fall to the ground, that is good advise. Anyway, my patch is thick so your help would be greatly appreciated. God Bless. I plan on doing this next week. I wanted to do it today, but here on the East coast it has been pouring since last night. The digging should be really easy when I do it since the ground is so saturated! I am completely new to gardening and have few questions. My mother recently dug up all the bulbs around my late grandmothers home because we are preparing to sell the place. These iris’, tulips, daffodils, and some others have been in our family for at least 70yrs. They were my great grandmothers and her gardens were absolutely beautiful (as I have seen in pictures) anyways, my mother gave them to me to plant at our new home here in st Simons island. She brought them to me completely submerged in a Rubbermaid container of water and I have since drained the water out. I am scared that she may have killed them and if not I need to know what things to look for, (such as if they are diseased and no longer salvageable, how to clean them up so that I can prepare them to plant and when and how to plant these. It is a lot to ask but I would love to see them in my yard since I know some of them are rare blooms and since they have been shared for generations. Thank you so much! Wow, sounds like you have your work cut out for you. 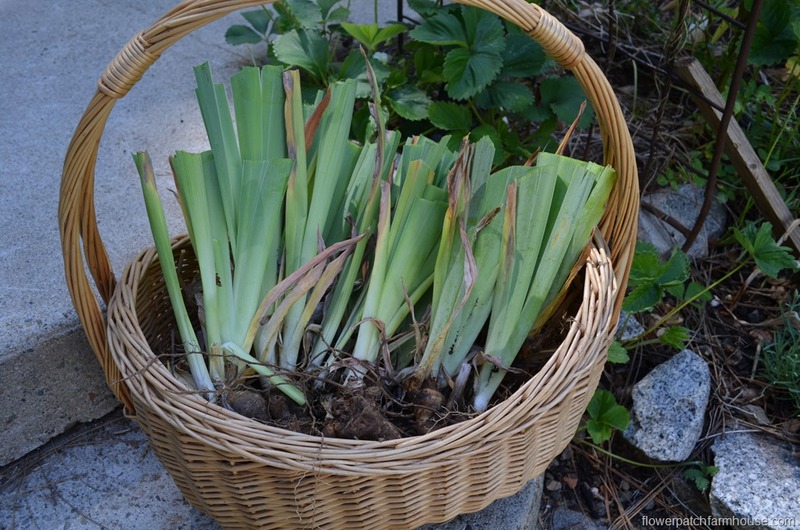 With the Iris, it is fairly easy to spot rot or bugs and being submerged in water is not a death knell for them, in fact where there is Iris Borers it is recommended to soak them in water to drown the little varmints. 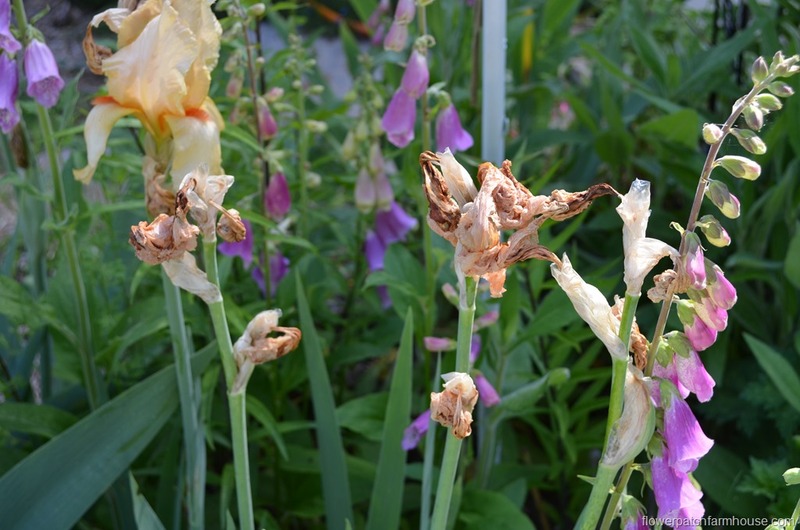 Iris bad spots are soft and mushy or shriveled up bits. Just cut them out or off. Most bulbs are the same, dry them out and look them over and if they look and feel solid (not squishy) then they should be fine. I am not sure where St. Simons Island is or your climate but the sooner you get them in the ground the better this time of year. Oh, I forgot to say how tulips like to be planted, 6 inches deep is good for most and the same with daffodils, 4 to 6 inches deep and pray you don’t have rascally squirrels that dig them up and replant them elsewhere for you. Thank you, I am going to replant to a new area where weeds are growing now. I also have many Iris’ but what I am interested in are the Fox Gloves that I saw in with your Iris’. The only Fox Glove that I ever had must have been transported by a bird, because it just showed up in my driveway. I didn’t know what it was and assumed that it was a wild flower. I loved it so much that I did some research and found that it was a Fox Glove. It was the only one and I wonder if you planted the seeds for them or did you buy bulbs or did it just show up the way mine did. Either way, I would love to have some more and would like to know how and where you got them and how to care for them as well. Looking forward to your advise. The foxgloves grow like weeds here and I started mine from seed. I have a few varieties like Pam’s Choice, Mountain King etc for different color choices. . Some garden centers do sell them in 6 packs if you want to start with plants. Foxgloves are biennials though new varieties now will bloom the very first year from seed. Biennials usually bloom on the second year from seeding. They like well drained soil so are good companions for Iris, though Foxgloves do like a good 2 inches or so of mulch(whereas the Iris do not) to retain soil moisture in extreme heat. You can let the main flower stalk go to seed for lots of babies the following season or cut it after bloom to get a few side shoots of flowers this season and it will still go to seed just maybe not get as many. Other than that they are pretty easy, oh, also they like full sun to light shade. Happy planting. When is the best time to plant the rhisomes? We live in NV and it is pretty dry here. Thanks for your comments. Since Iris love dry feet for the most part you can plant right now, just keep them well watered until established and they should do great. I am lots of iris passed down from my mother. I have separated many of them but have a hard time deciding which ones to replant and which ones to toss out. Can you show pictures of healthy rizhomes as well as ones that are diseased? Many of mine have never bloomed. Thanks! Actually the one in the photo is healthy, I just cut off part that had aged and was rather spent looking. The two still connected (to the left in the photograph of the “old gnarly bit”) are in great condition and ready to replant. Since rhizomes can look different at different stages I will see if I can find another to photograph and show. I have another bed I need to dig up so that won’t be too difficult. I am wondering , or maybe it’s a question , you say that when you deadhead the Irises that you ” snip every inch or two. I do this with the majority of my plants,” ….”… I will keep snipping until I reach the juncture of the leave” . Is there a reason that you do it every couple of inches vs just cut it off at the base,? Thanks ! And thanks for the pictures with the explanation. I cut every couple of inches and let it fall to the ground so it will compost in place, it is a form of sheet composting, the smaller pieces is so it will break down quicker. You can certainly cut the entire stem off in one cut and do with it what you please. Thanks I was just wondering about moving some of my Iris. Thank you so very much, I have grown them for years but always asked my parents, however now they are both gone to the heavenly flower garden, so had no one to ask. I am sorry about your parents, I too have lost my father and I miss him and his wisdom daily. Thanks for the tips Pamela and for sharing at Shabbilicious Friday. If I understand your tuitoral about Iris..you cut the bloom off after it has finished blooming, then you said something about snipping it every few inches and letting it lay on the ground to form compost..doesn’t that rot? How often do you snip till you get to the bottom of the stem? I hope I comprehended what you were relaying to us correctly. I have trouble understanding what I have read at times so bear with me. I snip the stem down to the apex of the leaves. By cutting it in short pieces it composts in place, the worms eat it and turn it under. This is loosely a form of “sheet composting”. No worries, I don’t mind questions. I realize I may not explain things perfectly clearly the first time around. Hi, Good Morning on this day of Eclipse, Aug 21, 2017. I have a question that you may have answered previously, if you have, where is the post, please. I have various iris, shasta daisys, peonies bee balm, and others that I want to learn how to keep track of. Do you use a separate calendar, or a special list maker thing to keep track of where what is, when to divide, Year, Month, etc. I would love to be able to keep track of my smallish yard with lots of plants. Wondering if anyone has good ideas for this. Thanks. Thank you also for very informative posts, each time I get my Flowerpatchfarmhouse messages. I love it. Good question, and I hope someone has a better answer than me. But my photos and this blog is my garden diary. I can go back and see when I took photos of a particular plant. I store my photos in digital files by year, then broken down into month then day. Thank you, I love sharing all my garden and projects here.